If you are visiting our city and looking for a tennis game contact John Cervantes and he will attempt to find you a partner or game during your stay in the city. The National Center for Sports Safety is focused on keeping your athletes safe both on and off the field. In celebration of April as Sports Safety Awareness Month, the NCSS Team has put together Top 10 List of Sports Safety Tips. 1. Have a plan in place should there be an injury or emergency. This is the first step to being prepared. Steps on setting up an Emergency Action Plan (EAP) can be found in the NCSS PREPARE course. 2. Always warm-up and stretch prior to activity. The warm-up helps blood flow to loosen the muscles. Stretching will help to decrease injury. 3. A cool-down period and stretching is also recommended. A cool-down aids the body in returning to its resting state. Stretching at the end may help to decrease soreness. 4. Stay hydrated! Drink plenty of fluids. Dehydration occurs faster than you think and can happen while exercising in the heat and in the cold. Hydrating is an important part of any activity. 5. Dress appropriately for your environment. Certain materials can actually be a barrier to the body trying to use its own cooling mechanism properly. Lighter weight and cooler clothing materials are recommended when outside in the heat.Thin layers that can be removed or added are best for cooler temperatures. 6. Always wear the proper equipment for the sport you are participating in. Make sure the equipment is in good repair. This is essential to reduce the risk of injury in sports at all levels. The National Operating Committee on Standards for Athletic Equipment (NOCSAE) is an excellent resource to determine appropriate standards. 7.Medications can affect health and hydration - adjust activity and fluid intake accordingly. Sometimes medications, such as allergy or cold medicine, can dehydrate the body. If engaging in exercise, be mindful to stay hydrated. 8. Rest is a treatment! Proper rest encourages the body to recover. Following an injury, strenuous workout, or competition, the body may need time to recover. Returning prematurely to activity may impair the healing process. •R - Rest Rest encourages the body to heal. •I - Ice Ice helps reduce pain and swelling. •C - Compression Compression holds ice in place and reduces the area of swelling. •E - Elevation Elevation uses gravity to assist in draining blood and fluid from an injured area. 10.Participating in sports should be fun! Enjoy! Patrick McEnroe has revealed that the United States Tennis Association’s desire to exert power over players, and a subsequent backlash, could have resulted in Andy Roddick’s decision not to play Davis Cup this year. 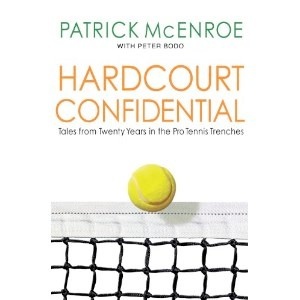 McEnroe’s revelations come in his new book “Hardcourt Confidential: Tales From Twenty Five Years In the Pro Tennis Trenches” that the United States Davis Cup captain of the last ten years co-wrote with the veteran American tennis journalist Peter Bodo. Until this year Roddick’s service in the cause of his country had been exemplary since making his debut against Switzerland when aged just 18 back in 2001. He had played in 23 ties, scoring 31 singles victories from his 42 rubbers, a record that leaves him second all time in US Davis Cup history to McEnroe’s esteemed elder brother John. In January Roddick announced he would not be available for Davis Cup selection this year as he sought to overcome injury problems that saw him miss the year ending Barclays ATP World Tour Finals in London and make a more concerted effort at the Grand Slam titles after performing so admirably to finish runner up to Roger Federer in an epic Wimbledon final. The causes were not on-court issues and the demands of playing. Rather economic issues and budgetary restraints on the team that a little over two years earlier had won the cup for the United States for the first time in 12 years. “He was pissed by the way the USTA started nitpicking the players’ phone bills, or insisting that Mike Bryan’s girlfriend take a cab and pay her own way to the airport when she had to leave a tie a day early,” writes McEnroe, whose Davis Cup deal is due to expire next year. In September the United States team, presumably still without the services of Roddick, will play to preserve World Group status for the first time since 2005. With both Roddick and James Blake opting not to play in February and Mike Bryan ruled out by illness, McEnroe was forced to rely on youngsters John Isner and Sam Querrey with the team losing 3-2 to Serbia on indoor clay in Belgrade. Today’s playing tip comes from Oscar Wegner. To learn more about Wegner, go to www.tennisteacher.com. Jim Courier had the strongest forehand of his time. It was a combination of power and topspin that took him to No. 1 in the world in 1992. He won two Australian Opens (1992-93) and two French Opens (1991-92). The particular aspect that made his forehand such a strong but simple shot was his racquet position in regards to the ball. He would follow it as if he was going to stop it in front of his face with the palm of his right hand. From there, it was easy. As soon as he felt the ball was within his grasp, he would release the strongest swing possible, across to his left. Even his body would shift to the left, aiding this huge punch. His trademark was his confidence in this relentless attack. He would hammer mercilessly every forehand ball. A particular drill that would help you understand this type of stroke would be to have someone feed you slow, high balls to your forehand side. Meanwhile you keep your hand and racquet pointing up and in front when the ball starts coming to you, and you look at the incoming ball through the strings, as if you would be looking at the back of your hand, not your palm. This is an exaggerated drill. Don't take it as if you would have to look at the ball through the strings in a match. After the bounce, just find the ball well, preferably near shoulder height, and hit it quite hard, as naturally as you can, with topspin and sidespin, going to your left (for a right hander). You'll notice your wrist will get used to this cocked position, giving you plenty of power, but also maximizing control. Do not force your wrist nor tighten up too much on your grip, which is one of the causes of tennis elbow. This stroke may be helpful, but if it causes you any physical trouble, it may not be for you.